Jan 1st - Urrgh! my head. Suddenly this idea I had at new year's eve seems a little far-fetched. After all there are some great dance tracks out there at the moment. I hope I can compete with them. Either way, I'll try to stick with it. Jan 2nd - Yay! It's my birthday. I'll start the project tomorrow. Jan 3rd - Ok, enough putting it off, lets begin. First of all I wrote this page for the site so I could chronicle my thoughts and achievements (if any) through the year. Thinking about it, it seems I would be more sellable to a big label if I did a lot more Djing and people could see me at gigs. The only sets I've done in the past were a couple of warm up sessions and that was with a single CD player, no mixing involved. So I think I'd better get some DJ equipment and start practising my mixing and beat-matching. Jan 4th - Luckily, in a software package that I use called Fruityloops, there is a turntable emulator so you can give tracks that scratching effect. This should be ideal for me to practice on. 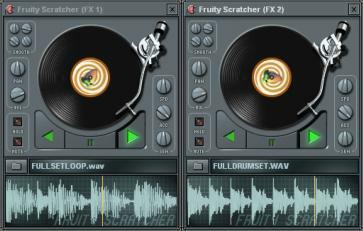 I've loaded the software up, added 2 of the turntables and loaded a different sample up in them both. One is 133bpm and the other is 140bpm. Now let's see if I can get them to play in time using the pitch shift. Good grief! This is harder than it looks. All I can get is galloping horses. Looks like I'm going to need some real practice at this to get them playing in sync with each other. Nope that's too hard, so I'll load up 2 samples playing at the same speed and try it with them. After 20 minutes or so, I can roughly make them play in time. It still sounds a little off though but I realise I will need to practice this (a lot). My first DJ setup - It's just a couple of virtual decks on my PC but it's a start. Jan 5th - I didn't have too much time today to work on the project but I practised my beat matching a little more and started thinking about what tracks to include on a demo disc to send to prospective labels. Jan 6th - I think I might be getting the hang of beat matching now. Trouble is, it takes me about 4 or 5 minutes to get the two tracks to play together so I'll have to find some records with REEEEEEEALLY long intros and endings! Jan 7th - Today I tried to decide which tracks to include on my demo disc. Run Away is a definite and I'll probably include You Can Dance. However, I'm not sure which will be the third track. There's no way I'd get away with including my Beyonce bootleg even though that seems to be really popular and I don't imagine the hard trance tracks are chart material. So I think I'll include Alone In The Crowd. Cami is going to re-record her vocals now we have access to a studio, an engineer and professional equipment to give the track a bit of polish as the original was recorded at her home. I'll put the instrumental on a CD and mail it to her which will give me time to seek out a few labels to send the disc to while Cami is in the studio. Jan 8th - Stopped practising beat-matching for a while and concentrated on my demo disc. We have a pub/bar in town called The Jailhouse and on Friday 9th January the DJ who does the breakfast show on Galaxy 105 (Simon Hirst) is making a guest appearance. That would be an ideal chance for me to give my demo to someone who might be able to play it. The only trouble is, my demo disc isn't ready as I still want Cami to record her vocals in the studio. What I think I'll do is to put Run Away, You Can Dance and my remix of Crazy In Love on a CD-R and hand it to him. Who knows, he might like them and play them on his breakfast show. Jan 9th - Tonight I went with my demo disc, out to the bar where the Galaxy DJ was appearing. I thought I'd get there early then I could give it to him before it got too busy, as he would be too involved with the crowd to have time for me. I arrived at 8pm but unfortunately, he wasn't turning up until 10pm so I had a couple of drinks and went through to the dancefloor area to watch my friend (DJ Miff) who is the resident DJ at The Jailhouse play his set. It was at that point that I realised that Djing probably isn't for me. Miff was amazing, every track blended in perfectly with the next and I knew I would have to practice incredibly hard to come close to his standard. He mixed Run Away into his set and people were dancing to it, which is always a good buzz for me. He said that he would be seeing Hirsty (the Galaxy 105 DJ) later and offered to give my demo to him. As the place was filling up quickly at this point and some people were coming in who I didn't particularly want to see, I figured that I probably wouldn't get chance to see Hirsty at a quiet moment so I gave Miff my disk and left. Lets hope he likes it! 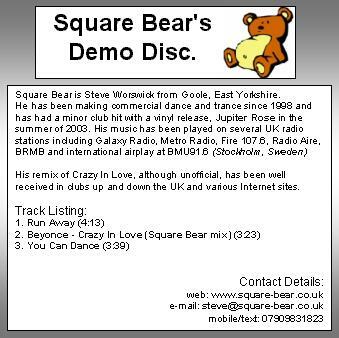 The demo disc cover - It's just a bit about me, contact details and a track listing. Short but sweet. Jan 10th - Went to visit another DJ friend of mine who advised me to concentrate more on producing rather than worrying about Djing. If a label likes me, it will be because of my music, not how well I DJ. I stayed for a while to listen to him and noticed that he didn't bother mixing all that much. When one song was about to end he faded it out and put on another, simple as that. I think I'll stick to that school. If any label insists I DJ then I might start practising again. Jan 11th - Started work on a new track. It's in a similar style to Firestorm, not all that commercial. I figure if I have a few different styles of music, I should appeal to a wider variety of labels. Jan 12th - Had a look around the internet for any record labels that may be interested in my music. So far, I've found All Around The World (Ultrabeat, Flip n Fill, N-Trance) and Incentive Music (Jan Wayne, Dee Dee). I picked these two as AATW said about my Crazy In Love remix, that "..if it had been authorised and made earlier in the year, it would have been a possible inclusion for Clubland 4" so they must like my music. Clubland 4 is a CD that's on general release at the moment and it would have been a great door opener to have appeared on it. Incentive Music picked one of my tracks, The Trancemission as one of the winners last year in a Dance eJay 5 competition. As a result of that, my track was pressed on to 10,000 promotional CDs, so again, they must like my music. I have a contact name at Incentive but not yet at AATW. It always looks more professional to address a demo disc to a person rather than a general A&R address. It's a good start but I need to find a few more labels to stand a better chance. Jan 13th - Received the vocals to the track I am remixing for Manchester based pop group Surmise. I've already started work on a remix after downloading a preview of the track but now I can do it properly. I believe the track is to be released in February so I'd better concentrate on that for the next few days. Hopefully, my remix will help bring my name to a larger audience. Labels included. Jan 14th - Continued work on the Surmise remix and also put a link to Run Away on a message board for fans of commercial music asking if they thought it was chart material. No replies yet but I'm keeping my fingers crossed. This will be the kind of audience I will be aiming for, so I might as well see if I'm on the right track. Jan 15th - Worked on the Surmise remix a little more. I also finished my new track. It's called Arctic Dawn and is complete except for a little piece of spoken word which I've asked Cami to do for me. I'll upload it to the site when it's complete. Jan 16th - Uploaded a instrumental preview of Arctic Dawn. I think it will be a bit too hard for the charts though either with or without vocals. Still, it's all good practice for me and is another song to add to my catalogue of tracks. Jan 17th - Uploaded a rough preview of my Surmise mix for the band to hear, to make sure it was the kind of sound they were after. I've got a bit of work still to do on it but Mike Baker from the band enjoyed what I'd done so far. Good, I'll finish it off next week. Jan 18th - Well, this week I've finished my Arctic Dawn track except for the vocals and Surmise seem happy with my remix so I've awarded myself a day off. Next week I'll finish the remix then I must concentrate on Alone In The Crowd ready for the demo disc. But right now it's time for a beer! Jan 19th - Bah! The power here has been up and down most of the afternoon. Apparently, a substation caught fire so I've not had chance to do any work today. I just get started and the electric goes off! It's like living in the Third world here sometimes. Whigfield - De De Na Ni Na! Jan 20th - Anyone remember Whigfield? She's a Danish singer who had a HUUUGE hit in 1994 with a song called Saturday Night. It reached number 1 in the UK and stayed at the top of the chart for 4 weeks! It even had its own little dance with it. Apparently she's making a comeback and is looking for new songs, so I'm seriously thinking of sending in some of mine to see if they are any good for her. Hopefully, that would be almost guaranteed Top 75 success. One of the benefits of having a record is that I've made some great contacts in the industry. I also learnt that The Backstreet Boys are looking for songs to include on their new album too, but I'll probably leave that opportunity as I can't see the lads getting down to some hard trance! *EDIT* I managed to upload the track late in the day. Jan 22nd - Spent time today working on Alone In The Crowd for Cami to re-record and then I'll get that in the mail for her. I've also just about finished the Surmise remix. They want a club version about 6-8 minutes long so I'm just adding the intro/outro and a break or two. Should be a good one I hope. I don't think I'll be allowed to upload it but if I ask them nicely, they might let me put a short preview on the site. Jan 23rd - Found another label that may be interested in my tracks (Data Records). That's three now. Keep your fingers crossed that at least one of them likes my music. Jan 24th - Finished Alone In The Crowd ready for Cami to re-record. I've added a few stereo effects to it and re-mastered it slightly. I'm also considering uploading this one for Whigfield as she needs all submissions by 30th January. Jan 25th - Ok, I've been brave and uploaded the new version of Alone In the Crowd for Whigfield's consideration. Keep your fingers crossed for me. If I get it, I'll be sure to give you all a wave from behind my synth when I'm backing her on Top Of The Pops hehe! Jan 26th - Worked on the Surmise remix. I'm not sure if I'm totally happy with it though. I think I might try and work another melody into it as I feel its lacking something at the moment. Jan 28th - Mike from Surmise heard my remix and said he really liked it. Yay!! He's going to let Susie (the vocalist) hear it as she's more into trance than he is. Sounds promising though. I'll upload a short preview, one or two minutes, as soon as I am allowed. Jan 29th - Well it looks like Surmise must like my remix as they've featured a preview of it on their site www.surmise.net and asked me to remix another track for them! I'll upload the preview to this site tomorrow (Jan 30th). Jan 30th - Got a message from a record label (GPLK Inc.) through this website looking for tracks to feature on a compilation album. I'm not quite sure how genuine they are as the site is hosted on a free webspace provider and the message was signed by Gaz. Anyway I'll check them out.